This freeway entrance sign is posted along northbound Hope Street between 37th Street and Exposition Boulevard near the University of Southern California. The onramp will take drivers onto the elevated section of the Harbor Freeway located near downtown Los Angeles. Photo taken 05/05/12. Northbound Gaffey Street (former California 110) approaches Fifth Street in San Pedro. California 110 used to be signed along Gaffey Street from Ninth Street north to the beginning of the Harbor Freeway. Photo taken 09/29/07. Northbound California 110/Gaffey Street meets at First Street in San Pedro. In a few blocks, Gaffey Street will meet the freeway entrance to the Harbor Freeway. Photo taken 09/29/07. Interstate 110 (Harbor Freeway) begins beyond Gaffey Street. The right two lanes of Gaffey Street become northbound Harbor Freeway, with a connection to California 47 (Vincent Thomas Bridge) available in the far right lane. A pedestrian overcrossing doubles as an arch wishing visitors to "come back to San Pedro soon." San Pedro is not its own city; it is actually a community within the city of Los Angeles. Photo taken 09/28/08. Northbound Interstate 110 (Harbor Freeway) and California 47 (Seaside Freeway) split at Exit 1A. California 47 travels east via the Vincent Thomas Bridge to Terminal Island, the Ports of Los Angeles and Long Beach. From Terminal Island, California 47 turns north to join the Alameda Corridor, which is a major north-south rail and truck route facilitating cargo from the ports north to the major shipping and rail centers near Downtown Los Angeles. Photo taken 09/28/08. The first reassurance route marker for Interstate 110 appears beyond the exchange with California 47. Photo taken 07/13/09. The next exit along Interstate 110 north is Exit 1B, Channel Street and John S. Gibson Boulevard. Photo taken 02/02/08. The next exit along northbound Interstate 110/Harbor Freeway is Exit 3A, C Street (one and a quarter miles). Photo taken 02/02/08. The next three exits along Interstate 110 north are: Exit 3A, C Street; Exit 3B, Anaheim Street; and Exit 4 to California 1 (Pacific Coast Highway). Photo taken 07/13/09. Northbound Interstate 110 reaches Exit 3A, C Street. The next exit is Exit 3B, Anaheim Street (one half mile). Photo taken 07/13/09. This mileage sign outlines the succeeding three exits along Interstate 110 (Harbor Freeway) north. Photo taken 07/13/09. Northbound Interstate 110/Harbor Freeway reaches Exit 3B, Anaheim Street. Photo taken 07/13/09. This mileage sign provides the distance to the next three exits along Interstate 110/Harbor Freeway north: Exit 4, California 1/Pacific Coast Highway; Exit 5, Sepulveda Boulevard; and Exit 7, Carson Street. Photo taken 07/13/09. An Interstate 110 north reassurance shield is posted along the Harbor Freeway north prior to the Exit 4 interchange (California 1/Pacific Coast Highway). Photo taken 02/02/08. Northbound Interstate 110/Harbor Freeway reaches Exit 4, California 1/Pacific Coast Highway. California 1 travels east to Long Beach and west to Lomita and Torrance. At this point, Historic U.S. 6 (which once traveled along adjacent Figueroa Street north of California 1) joins the Harbor Freeway north toward downtown Los Angeles. Photo taken 07/13/09. This mileage sign provides the distance to the next three exits along Interstate 110/Harbor Freeway north: Exit 5, Sepulveda Boulevard; Exit 7, Carson Street; and Exit 8, Torrance Boulevard and Del Amo Boulevard. Photo taken 07/13/09. Between California 1 and California 91, Interstate 110/Harbor Freeway serves as the western border of the city of Carson ("Future Unlimited," population 89,730 as of the 2000 Census, and incorporated on February 20, 1968). The next three exits all serve the city of Carson. Photo taken 02/02/08. Northbound Interstate 110/Harbor Freeway reaches Exit 5, Sepulveda Boulevard west to Torrance and east to Carson and Long Beach. Upon crossing into Long Beach, Sepulveda Boulevard changes into Willow Street (at the intersection with California 103/Terminal Island Freeway). Photo taken 07/13/09. The next exit along Interstate 110/Harbor Freeway north is Exit 7, Carson Street. Photo taken 02/02/08. This mileage sign provides the distance to the next three exits along Interstate 110/Harbor Freeway north: Exit 7, Carson Street; Exit 8, Torrance Boulevard and Del Amo Boulevard; and Exit 9, Junction Interstate 405/San Diego Freeway north to Los Angeles International Airport and south (east) to Long Beach. Photo taken 07/13/09. Northbound Interstate 110/Harbor Freeway reaches Exit 7, Carson Street. Photo taken 07/13/09. An overhead guide sign assembly mounted on the Carson Street overpass advises of the pending interchange between Interstate 110/Harbor Freeway and Interstate 405/San Diego Freeway. Photo taken 02/02/08. Second photo taken 07/13/09. This mileage sign provides the distance to the next four exits along Interstate 110/Harbor Freeway north: Exit 8, Torrance Boulevard and Del Amo Boulevard; Exit 9, Junction Interstate 405/San Diego Freeway; and Exits 10A-B, California 91. Photo taken 07/13/09. Second photo taken 02/02/08. The next exit along Interstate 110 north is for Torrance Boulevard and Del Amo Boulevard east to Avalon Boulevard north to California State University Dominguez Hills. Photo taken 02/02/08. Northbound Interstate 110/Harbor Freeway reaches Exit 8, Torrance Boulevard and Del Amo Boulevard. Photo taken 02/02/08. This mileage sign provides the distance to the next four exits along Interstate 110/Harbor Freeway north: Exit 8, Torrance Boulevard and Del Amo Boulevard; Exit 9, Junction Interstate 405/San Diego Freeway; and Exits 10A-B, California 91. Photo taken 02/02/08. Northbound Interstate 110/Harbor Freeway meets Exit 9, Junction Interstate 405/San Diego Freeway. To California 91, proceed north along Interstate 110. Photo taken 02/02/08. Second photo taken 07/13/09. This view shows the transition ramp from Interstate 110/Harbor Freeway north to Interstate 405. Stay left for Interstate 405 north to Los Angeles International Airport, Santa Monica, and Sacramento. Stay right for Interstate 405 south to Long Beach, Irvine, and San Diego. Photo taken 02/02/08. Due to heavy traffic on both Interstate 110 and Interstate 405, merging traffic should be prepared to stop due to possible congestion. Photo taken 02/02/08. The two-lane transition ramp from Interstate 110 north to Interstate 405 north passes under the mainline of Interstate 405. Photo taken 02/02/08. Back on the mainline of Interstate 110 north freeway reenters the city of Los Angeles ahead of Exits 10A-B for California 91 (Gardena Freeway east / Artesia Boulevard west). Photo taken 07/13/09. Traffic from Interstate 405 merges onto both sides of Interstate 110. Two ramps from Interstate 405 merge onto Interstate 110 north. The first picture shows the perspective from the car transition ramp from Interstate 405 north to Interstate 110 north; the second picture shows the perspective from the main lanes. Photo taken 09/25/05. Second photo taken 07/13/09. The right two lanes will connect to California 91. The first right is Exit 10A, California 91/Garden Freeway east to Long Beach, Anaheim, and Riverside. The second right connects to a loop ramp for Exit 10B, California 91/Artesia Boulevard west to Gardena and Manhattan Beach. Photo taken 09/25/05. Second photo taken 07/13/09. California 91 is a major east-west freeway leading east from Gardena through Carson and Compton to northern Long Beach, Anaheim, Fullerton, Corona, and Riverside. Photo taken 12/25/04. Northbound Interstate 110/Harbor Freeway reaches Exit 10A, California 91/Gardena Freeway east to Anaheim and Riverside. No control cities are used on these overhead guide signs. Photo taken 12/25/04. The next exit along Interstate 110 north is Exit 10B, California 91/Artesia Boulevard west to Gardena. Photo taken 07/13/09. Northbound Interstate 110/Harbor Freeway reaches Exit 10B, California 91/Artesia Boulevard west to Gardena. Photo taken 09/25/05. The Harbor Transitway begins at the Artesia Transit Center located between 182nd Street and California 91, then travels north in the median of Interstate 110 from here north to just shy of the Interstate 10 interchange near downtown Los Angeles. Photo taken 09/25/05. This Interstate 110 north reassurance shield is posted after traffic merges onto northbound from California 91. Photo taken 07/13/09. This mileage sign provides the distance to the next three exits along Interstate 110/Harbor Freeway north: Exit 11, Redondo Beach Boulevard; Exit 12, Rosecrans Avenue; and Exit 13, El Segundo Boulevard. Photo taken 07/13/09. The next exit along Interstate 110/Harbor Freeway north is Exit 11, Redondo Beach Boulevard. Photo taken 07/13/09. Northbound Interstate 110/Harbor Freeway meets Exit 11, Redondo Beach Boulevard. The next exit along Interstate 110 north is Exit 12, Rosecrans Avenue. Photo taken 12/25/04. A carpool entrance is available to the Harbor Transitway shortly after the offramp to Exit 11. Photo taken 07/13/09. Shortly thereafter, Interstate 110/Harbor Freeway north meets Exit 12, Rosecrans Avenue west to Gardena and east to Rosewood, West Rancho Dominguez, and Compton. Photo taken 07/13/09. This mileage sign provides the distance to the next three exits along Interstate 110/Harbor Freeway north: Exit 13, El Segundo Boulevard; Exit 14A, Junction Interstate 105/Glenn Anderson Freeway east; and Exit 14B, Junction Interstate 105/Glenn Anderson Freeway west, Imperial Highway, and Century Boulevard. Photo taken 07/13/09. The next exit along Interstate 110/Harbor Freeway north is Exit 13, El Segundo Boulevard east to Athens Village, Willowbrook, and Compton and west to Athens and Gardena. Photo taken 07/13/09. Northbound Interstate 110/Harbor Freeway reaches Exit 13, El Segundo Boulevard. Photo taken 07/13/09. This mileage sign provides the distance to the next two exits along Interstate 110/Harbor Freeway north: Exit 14A, Junction Interstate 105/Glenn Anderson Freeway east and Exit 14B, Junction Interstate 105/Glenn Anderson Freeway west, Imperial Highway, and Century Boulevard. Photo taken 07/13/09. Interstate 105, completed in 1993, is the Glenn Anderson Freeway between El Segundo and Norwalk. A light rail line (Metro Green Line) follows most of the freeway in the median. An impressive, five-level stack interchange serves as the connection between Interstate 110 and Interstate 105. Photo taken 12/25/04. Northbound Interstate 110/Harbor Freeway meets Exit 14A, Junction Interstate 105/Glenn Anderson Freeway east to Norwalk. The second exit connects to Exit 14B, Junction Interstate 105/Glenn Anderson Freeway west, Imperial Highway, and Century Boulevard. Photo taken 12/25/04. Use Exit 14B to Junction Interstate 105/Glenn Anderson Freeway west, Imperial Highway, and Century Boulevard. Photos taken 07/13/09. Northbound Interstate 110/Harbor Freeway meets Exit 14B, Junction Interstate 105/Glenn Anderson Freeway west, Imperial Highway, and Century Boulevard. The offramp to Exit 14B immediately divides, with the right lane connecting to Interstate 105 west. Photo taken 07/13/09. A towering tangle of ramps stack above Interstate 110/Harbor Freeway at the Interstate 105/Glenn Anderson Freeway interchange. In addition to providing connectors between all directions of both freeways, the Transitway lanes have direct connectors to the Interstate 105 carpool lanes, thus adding a new layer on top of the stack interchange. Photo taken 07/13/09. The interchange between Interstate 110/Harbor Freeway and Interstate 105/Glenn Anderson Freeway is named in honor of Judge Harry Pregerson. Photo taken 12/25/04. This series of pictures shows the progression of ramps and towering bridges that constitute the interchange between Interstate 110 and Interstate 105. Photo taken 09/25/05. Second photo taken 07/13/09. Third photo taken 12/25/04. Looking at the impossibly high transition ramps of the 105-110 interchange, this view shows the transition ramp from the high occupancy vehicle lanes on westbound Interstate 105 to northbound Interstate 110. Photo taken 02/15/04. Now descending from such heights, the high occupancy vehicle lanes from westbound Interstate 105 enter northbound Interstate 110 on the left so as to merge with the Interstate 110 high occupancy vehicles. The skyline of downtown Los Angeles is visible in the distance. Photo taken 02/15/04. This picture provides another view of the high occupancy (carpool) vehicle transition lane as it reaches the level of Interstate 110. Photo taken 02/15/04. Back in the main lanes and leaving the Interstate 105 interchange, this mileage sign along northbound Interstate 110/Harbor Freeway provides the distance to the next three exits: Exit 16, Junction Former California 42/Manchester Avenue; Exit 17, Florence Avenue; and Exit 18A, Gage Avenue. Photo taken 09/25/05. The right two lanes will connect to Exit 16, Manchester Avenue. Until the late 1990s, Manchester Avenue was signed as California 42, even though it was removed from the legislative state route system many years prior. However, when Interstate 105 was completed, California 42 was no longer needed as a state highway, and it was turned back to the cities it passed through. Remnants of the old designation are still clearly visible on this sign located along northbound Interstate 110/Harbor Freeway approaching Exit 16, Manchester Avenue. Photo taken 07/13/09. The Transitway (high occupancy vehicle lanes) approaches a bus ramp prior to the offramp to Manchester Avenue. The high occupancy vehicles become separated from the main lanes of the freeway, with connections back to the mainline between Exits 20-21. Photo taken 09/25/05. Second photo taken 02/15/04. Northbound Interstate 110/Harbor Freeway meets Exit 16, Junction Former California 42/Manchester Avenue. Photo taken 09/25/05. This mileage sign provides the distance to the next three exits along Interstate 110/Harbor Freeway north: Exit 17, Florence Avenue; Exit 18A, Gage Avenue; and Exit 18B, Slauson Avenue. Photo taken 07/13/09. The next exit along Interstate 110/Harbor Freeway north is Exit 17, Florence Avenue. Photo taken 07/13/09. Northbound Interstate 110/Harbor Freeway reaches Exit 17, Florence Avenue. Photo taken 09/25/05. This mileage sign along northbound Interstate 110/Harbor Freeway provides the distance to the next three exits: Exit 18A, Gage Avenue; Exit 18B, Slauson Avenue; and Exit 19, Vernon Avenue. Photo taken 09/25/05. The next exit along Interstate 110/Harbor Freeway north is Exit 18A, Gage Avenue. Photo taken 09/25/05. A second interchange sequence sign along northbound Interstate 110 (Harbor Freeway) precedes Exit 18A to Gage Avenue. Photo taken 09/25/05. Northbound Interstate 110/Harbor Freeway reaches Exit 18A, Gage Avenue. Photo taken 09/25/05. Over in the Transitway/HOV lanes, an overhead sign separates through traffic from buses in anticipation of the bus stop at Slauson Avenue. Photo taken 09/25/05. Northbound Interstate 110/Harbor Freeway reaches Exit 18B, Slauson Avenue. Slauson Avenue gained notoriety in the early 1990s when it was mentioned in Dr. Dre's song "Let Me Ride" from 1992. Proceeding north, Interstate 110 passes through the heart of South Central Los Angeles (still within the city of Los Angeles). Photo taken 07/13/09. This Interstate 110 north reassurance shield is posted along the northbound Harbor Freeway after the onramp from Slauson Avenue and prior to Exit 19, Vernon Avenue. The downtown Los Angeles skyline comes into view in the distance ahead. Photo taken 07/13/09. This interchange sequence sign along northbound Interstate 110/Harbor Freeway provides the distance to the next three exits: Exit 19, Vernon Avenue; Exit 20A, Dr. Martin Luther King, Jr. Drive; and Exit 20B, 37th Street and Exposition Boulevard. Photo taken 09/25/05. The 110 Transitway elevates above the main lanes, and the main lanes descend below grade. Photo taken 09/25/05. The next exit along Interstate 110/Harbor Freeway north is Exit 19, Vernon Avenue, one half mile. Photo taken 09/25/05. Northbound Interstate 110/Harbor Freeway reaches Exit 19, Vernon Avenue. Photo taken 09/25/05. With the high-occupancy vehicle lanes elevated and straddling the north and southbound lanes, this mileage sign along northbound Interstate 110/Harbor Freeway provides the distance to Exit 20A, Dr. Martin Luther King, Jr. Drive and Exit 20B, 37th Street and Exposition Boulevard. Taking either route west leads to the University of Southern California, which has won several college football championships, including a joint title with Louisiana State University for the Fall 2003 season. Photo taken 09/25/05. Northbound Interstate 110/Harbor Freeway reaches Exit 20A, Dr. Martin Luther King, Jr. Drive to Exposition Park. Photo taken 07/13/09. As the Transitway (high-occupancy, grade-separated lanes) comes to an end, this mileage sign along Interstate 110/Harbor Freeway north provides the distance to Exit 20B, 37th Street and Exposition Boulevard; Exit 20C, Adams Boulevard, and Exit 21, Junction Interstate 10/Santa Monica Freeway. Photo taken 09/25/05. Second photo taken 02/15/04. Motorists along the high occupancy vehicle lanes have an array of their own options on the separated lanes. The left lane provides carpool only access to 39th Street, while the middle lane heads into downtown via Adams Boulevard and Figueroa Street. All through traffic should merge to the right lane to continue north on Interstate 110, which downgrades to California 110 upon crossing the Interstate 10 interchange (Exit 21). Photo taken 09/25/05. Second photo taken 02/15/04. At the same time, through traffic leaves the segregated high occupancy vehicle lanes and merges onto northbound Interstate 110. The high occupancy vehicle lanes continue north, but they do not rejoin the freeway; instead, they head into downtown Los Angeles. There are plans to extend the high occupancy lanes further along Interstate 110 and California 110, but that would be a costly endeavor. Photo taken 09/25/05. Second photo taken 02/15/04. Northbound Interstate 110/Harbor Freeway reaches Exit 20B, 37th Street and Exposition Boulevard. Photo taken 07/13/09. The downtown Los Angeles skyline is visible in this panoramic picture along northbound Interstate 110/Harbor Freeway as we approach Exit 20C, Adams Boulevard. The upcoming exits mileage sign here also provides the distance to Exit 21, Junction Interstate 10/Santa Monica Freeway. It was a very clear day in sunny Los Angeles! Photo taken 08/26/07. Second photo taken 08/26/07. Third photo taken 07/13/09. Northbound Interstate 110/Harbor Freeway goes below grade again as it approaches Exit 20C, Adams Boulevard. Photo taken 09/25/05. Northbound Interstate 110/Harbor Freeway reaches Exit 20C, Adams Boulevard. Photo taken 07/13/09. Interstate 110 drops below the Transitway ramp into downtown Los Angeles. The next exit along Interstate 110 (Harbor Freeway) north is with Interstate 10. Upon reaching I-10, I-110 downgrades to California 110, but the Harbor Freeway continues north until reaching the Four-Level Interchange (U.S. 101). Photo taken 09/25/05. Northbound Interstate 110/Harbor Freeway approaches Exit 21, Junction Interstate 10. The far right lane is for eastbound and the second lane from the right is for westbound. Photo taken 07/13/09. This mileage sign along northbound Interstate 110/Harbor Freeway provides the distance to the next four exits: Exit 21, Junction Interstate 10/Santa Monica Freeway; Exit 22, 6th Street and 9th Street (called the "Downtown Exit" on this sign), and Exits 23A-B, 4th and 3rd Streets. Exit 21 serves Interstate 110; Exits 22 and 23A-B serve California 110. Photo taken 07/13/09. The next exit along Interstate 110/Harbor Freeway north is Exit 21, Junction Interstate 10/Santa Monica Freeway. Note the green overlay panels that feature the California 110 shields; they used to be California 11 shields. Photo taken 07/13/09. Second photo taken 12/25/04. These small reflective signs are mounted on a bridge over northbound Interstate 110/Harbor Freeway; they are placed here to remind motorists of the lane allocation on the approach to Exit 21, Junction Interstate 10/Santa Monica Freeway. Photo taken 07/13/09. 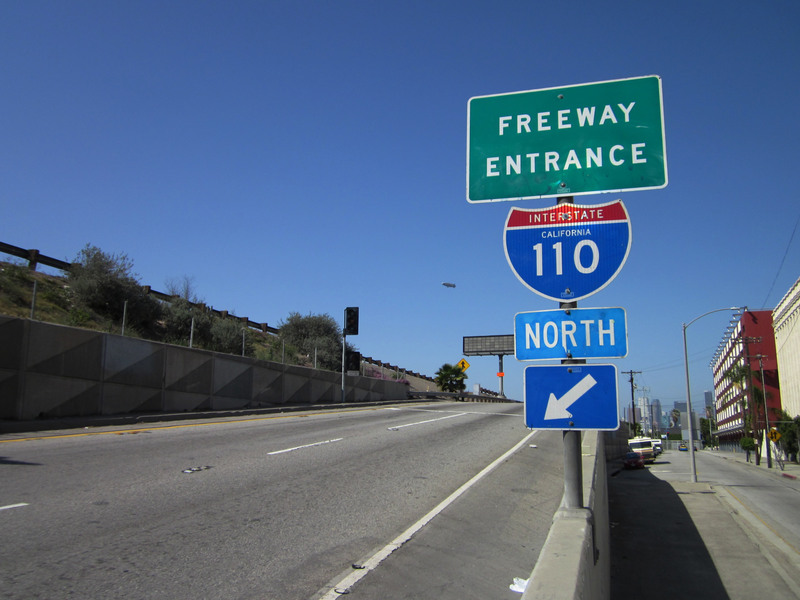 Interstate 110 ends as the two right lanes exit onto Interstate 10; California 110 continues north along the Harbor Freeway into downtown Los Angeles. The second largest city in the country, Los Angeles is the hub of Southern California and a major media market. Most movies made in the United States come from Hollywood, a community of Los Angeles. California 110 now passes through what is arguably one of the most recognizable skylines in the country, due to its presence in many movies. Photo taken 07/13/09. Second photo taken 12/25/04. View of the signage for Interstate 10 east and west taken from the transition ramp as seen from northbound Interstate 110/Harbor Freeway. Use Exit 21 to Pico Boulevard as well as both directions of Interstate 10. Photos taken 07/13/09. These roadside signs are posted along California 110/Harbor Freeway north prior to passing through the Interstate 10 interchange. To the Los Angeles Central (Richard M. Riordan) Library, use Exit 23A, Sixth Street. To the Fashion Institute of Design & Merchandising, use Exit 22, Ninth Street. Photo taken 04/30/06.